By Kori ~ August 6th, 2012. Winemaker Tim Sorenson and his wife Nancy Rivenburgh founded Fall Line Winery in 2003. Located in South Seattleâ€™s Georgetown neighborhood, the winery was officially licensed and bonded in 2004. Both Tim and Nancy are avid skiers and the name â€œFall Lineâ€ refers to the natural line of descent on a slope. Until he retired last year, Tim was an economics professor at Seattle University. For years, he balanced his day job at the university with his budding wine career. He completed an Introduction to Winemaking course at the University of California-Davis in 2000 and has never looked back. 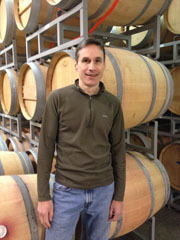 Tim met many local winemakers during his time working at a wine shop in downtown Seattle that led to a two-year â€˜vinternshipâ€™ with Ben Smith at Cadence Winery from 2002 to 2004. The 2003 vintage was Fall Lineâ€™s inaugural commercial release. Fall Line now produces about 1,800 to 2,000 cases annually. The core of Fall Lineâ€™s lineup is comprised of three single-vineyard wines, all classic Bordeaux-style red blends. Fall Line partners with three of the most well-regarded vineyards in Washington State, all located in the Yakima Valley AVA, Artz Vineyard, Boushey Vineyard, and Red Willow Vineyard. Red Willow Vineyard, which sits in the northwest corner of the Yakima Valley AVA, is located on the fourth-generation family farm established by grower Mike Sauerâ€™s grandfather-in-law in the 1920â€™s. The iconic Monsignor Chapel sits atop Red Willowâ€™s highest hill, built with native stones from the farm. Fall Line has been working with Red Willow since 2008 and introduced its Red Willow Vineyard Red Blend in 2010. 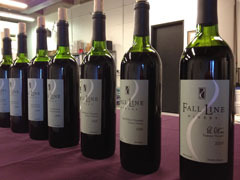 Recently, we had the pleasure to visit with Tim and taste through Fall Lineâ€™s current and upcoming releases. With the 2008 vintage, Fall Line ushered in their all Yakima Valley program. The 2009 vintage marks the introduction of a new wine to Fall Lineâ€™s lineup, a Tempranillo from Boushey Vineyard. We tasted the Tempranillo as well as both the 2008 and 2009 vintages of the single-vineyard blends. While we were very impressed with all seven wines, we thought that the 2008 Artz Vineyard and the 2009 Red Willow Vineyard were truly outstanding. I am especially looking forward to trying the 2009 Red Willow again in a few years when it has had additional time to age. 2008 Fall Line Winery Artz Vineyard Red Blend (Red Mountain, Yakima Valley, Washington): 46% Cabernet Franc, 36% Merlot, and 18% Cabernet Sauvignon. Deep, dark purplish red. Very aromatic with spice, cinnamon, and red and black fruit on the nose. Blackberry, black cherry, and cinnamon as well as floral and herbal notes come through on the palate. Full-bodied with lively acidity and medium to high, chewy tannins. Big and bold yet well-balanced with good complexity and a long, lingering finish. 2009 Fall Line Winery Artz Vineyard Red Blend (Red Mountain, Yakima Valley, Washington): 41% Cabernet Franc, 35% Merlot, and 24% Cabernet Sauvignon. Deep, dark purplish red. Aromatic with cinnamon, gingerbread, clove, red cherry, and raspberry on both the nose and palate. Medium-bodied with lively acidity, medium tannins, and a long finish. 2008 Fall Line Winery Boushey Vineyard Red Blend (Yakima Valley, Washington): 43% Cabernet Franc, 29% Merlot, and 28% Cabernet Sauvignon. Deep, dark red in color. Aromatic with black cherry, cherry cola, oak, and smoke on the nose. More black cherry, smoke, and cola come through on the palate. Medium to full-bodied with crisp acidity and medium, smooth tannins. Well-balanced with a long finish. 2009 Fall Line Winery Boushey Vineyard Red Blend (Yakima Valley, Washington): 39% Cabernet Franc, 34% Merlot, and 27% Cabernet Sauvignon. Deep, dark red in color. Gorgeous nose with black cherry, smoked meat, spice, and herbal aromas. Good mouthfeel with black cherry, blackberry, smoked meat, spice, and a faint vegetal note on the palate. Medium to full-bodied with crisp acidity and medium to high tannins. Well-balanced with a long, smooth finish. 2008 Fall Line Winery Red Willow Vineyard Red Blend (Yakima Valley, Washington): 53% Merlot, 27% Cabernet Sauvignon, and 20% Cabernet Franc. Deep, dark red. Nose is a bit tight at first and then beautiful aromas of black fruit, perfume, licorice, and spice come through. Good fruit on the palate with more blackberry, black cherry, and spice as well as cocoa and savory notes. Medium to full-bodied with crisp acidity and medium, chewy tannins. Well-balanced with a long finish. 2009 Fall Line Winery Red Willow Vineyard Red Blend (Yakima Valley, Washington): 64% Merlot, 21% Cabernet Sauvignon, and 15% Cabernet Franc. Deep, dark red. Gorgeous nose with black plum, black cherry, lavender, licorice, clove, and cinnamon aromas. More cinnamon, black plum, lavender, and dark chocolate come through on the palate. Full-bodied with crisp acidity and chewy tannins. Well-balanced with good complexity. A big, bold wine with great mouthfeel and a long, lingering finish. Very young but outstanding already and should only get better with some age. 2009 Fall Line Winery El Otro Tempranillo (Boushey Vineyard, Yakima Valley, Washington): 100% Tempranillo. Deep purple in color. Lovely aromatics with black and blue fruits and floral notes on the nose. Black cherry, violet, spice, and a touch of leather come through on the palate. Medium-bodied with lively acidity and smooth tannins. Well-balanced with a long finish. I tasted Fall Line’s 09 Boushey beside about a dozen other Boushey wines and it was perhaps the class of the field, certainly for Bordeaux varietals, at about half the price of some of the others. They are now on my radar big time! Thanks! Glad to hear that Fall Line in on your radar too. Excellent wines that deliver serious bang for your buck. Gotta love that! Cheers!